AgroAtlas - Crops - Hordeum vulgare L. - Common barley (winter). Hordeum vulgare L. - Common barley (winter). Family Poaceae Barnhart, genus Hordeum L.
2n=14, 28. Annul plant. Height 30-90 cm. Leaves with big, wide, falcated auricles; ligula is short, often with a border. Ears oblong, aristated, rarely without aristas, multiserial or two-rowed; spicates uniflorous. Glumes narrow, less than 1 mm wide, often pubescent. Lemma convex with five veins, turns into denticulated or smooth arista; upper palea obtuse with two veins and a small rachis at the base. Upper palae and lemma grow together with caryopsis in paleaceous barley, yet they grow independently in naked barley. Caryopsis 7-10 mm in length, 2-3 mm in width, rhombic, lengthened or elliptical in form, slightly constrained, with a groove on the underside. Color of caryopsis is different, often stramineous. There are 45-50 grains in an ear. Mass of 1000 grains often exceeds 40 g. Varieties of winter barley include Viktoria, Vavilon, Rosava, Rostovskij 55, Siluet, Skorohod, and Pavel. No wild species have been identified. Common barely was one of the first grasses, whose caryopses were utilized as food by people in the Late Stone Age. Centers of origin include the Mediterranean and Central and Eastern Asia. The parent species is most likely wild barley (H. spontaneum C. Koch). Barley began to be cultivated in Turkmenia around 3,000 B.C. In the former USSR, crops cover about 32.5 million hectares in different climatic zones. Winter barley is cultivated in Central Asia, Azerbaijan, the Northern Caucasus, Moldova, Ukraine, southern regions of Russia, and as far north as 50° northern latitude, where barely occupies more than 1.3 million hectares. Main crops are grown in Transcaucasia, Uzbekistan, Turkmenia, Tajikistan, and Kirgizia. Does not demand much heat; shoots withstand light frosts. Winter barley does not withstand long frosts of -12-14°C or spurts of extreme cold during early spring (it is not as winter-hardy as winter wheat). Optimal temperature for growth 15-17°C. Drought-resistant. Requires much moisture during vegetative period and shoot production. Plant prefers long days. Comparatively demanding on soil fertility. Does not do well in dry, acidic, sandy, peaty, salinized or solonetzic soils. Prefers soil with a neutral pH (6-7). Early ripening is typical. Vegetation period lasts 230-300 days. Usually self-pollinated. Grain is 10.5-14.4% protein, about 65% carbohydrates, and 2.3-4.0% fat. Use mainly for concentrated forage. Cultivated in grass mixtures used for green forage in southern regions. 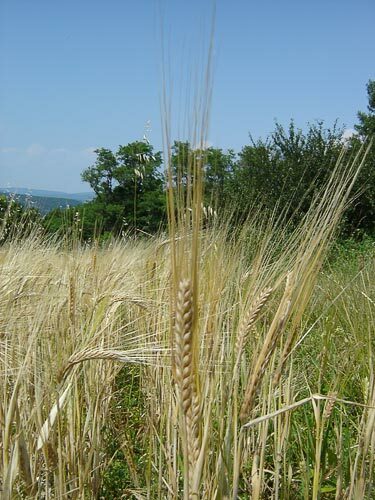 Grain used for pearl barley and peeled barley production, as a coffee substitute, and for flat-cake flour; it is also the main raw material used in beer production. Productivity of winter barley is 2-6 (up to 9-10 with irrigation) tons per hectare. Dankova N.I., ed. 1988. Winter barley. Intensive technology. Moscow: Agropromizdat. 80 p.
Kobylianskij V.D., Lukjanova M.V., eds. 1990. Barley. Cultural flora of the USSR. Vol. II, part 2. Leningrad: Agropromizdat. 424 p.
Korenev G.V., Podgornyi P.I., Shcherbak S.N. 1990. Plant Growing with Basics of Selection and Seed Growing. Moscow: Agropromizdat. 574 p.
Koronevskij V.I. 1980. Technology of getting high crop of winter wheat and barley. Minsk. 40 p.
Kosinskij V.S., Nikliaev V.S. 1990. Basis of agriculture and plant growing. Moscow: Agropromizdat. 480 p.
Kuptsov A.I. 1975. Introduction in geography of cultural plants. Moscow: Nauka. 296 p.
Vehov V.N., Gubanov I.A., Lebedeva G.F. 1978. Cultural plants of the USSR. Moscow: Mysl'. 336 p.